To make your Exchange 2007 server compatible with your existing Exchange Organization, avoid anything with ‘2000’ in its name. For instance, raise an Exchange 2000 organization to Exchange 2003 native. The nearer to the ideal of Exchange 2007 server on Windows Server 2008 in an Exchange 2007 Organization, the fewer compatibility problems you will encounter. Get the EXBPA (Exchange Best Practice Analyser) and seek out the ‘Exchange 2007 Readiness Check’. Don’t wait until you have installed Exchange 2007, run the Readiness check from XP, or Vista and point the wizard to the server where you are thinking of installing Exchange 2007. EXBPA will help you identify and correct any Exchange compatibility problems. 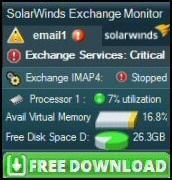 The first practical point is that Exchange 2007 server must be installed on a 64-bit operating system. Talking of hardware, make sure that your proposed server features in the Windows Server Catalog (Hardware Compatibility List). There is good news with ‘Editions’, there are no compatibility problems between Exchange and Windows Server. As far as I can see, when it comes to Windows Server operating system and Exchange editions, any combination of Enterprise or Standard editions works. For example, Windows Server 2008 enterprise with Exchange 2007 server standard edition. When it comes to deciding editions, don’t just think short-term, ‘The standard edition will save us money’, but also take the long view, ‘Do we need clustering?’ If so we are going to need the enterprise edition. If you must deploy Windows Server 2008 directory servers in a site that contain Exchange 2000, you must first hard code Directory Service Access (DSAccess). To achieve Exchange compatibility you must configure each Exchange 2000 server in the site to point to directory servers running Windows Server 2003 or Windows 2000 Server. At one time Microsoft were obsessed with backwards compatibility, for instance, Windows Server 2003, Windows 2000 and NT 4.0 could all operate in the same domain. So what’s the problem with Exchange compatibility? The answer lies in the schema, and the heart of the problem is that Exchange 2000 is incompatible with the Active Directory schema of Windows Server 2003 and later. The second problem is that while Exchange 5.5 servers can operate in Windows 2000 domains, Windows Server 2003 domains are not compatible with Exchange 5.5.. Some Microsoft bashers say that this lack of backwards compatibility is laziness, others say that ditching backwards compatibility allows progress. What ever the reasons and the history, Exchange Server 2007 cannot co-exist with Exchange 5.5, and there are severe limitations if you must persevere with that 8 year old technology that is Exchange 2000. Where possible I like to keep everything in sync, thus gain maximum Exchange 2007 compatibility. Here are my recommendations. Exchange Organization = Exchange 2003 native: Operating system(s) = Windows Server 2008 or 2003 with a mixture of Exchange 2007 and 2003 Server. On the client side, Outlook 2007 or 2003. Most people spell it compatibility, but for those who prefer compatAbility, here is a page for you! Exchange Server 2010 is a complex topic, do you need practical hands on training? As an MCT trainer, I can thoroughly recommendTrainSignal. In particular, I like the way that TrainSignal use a variety of learning methods, instructor lead, video and of course text material.